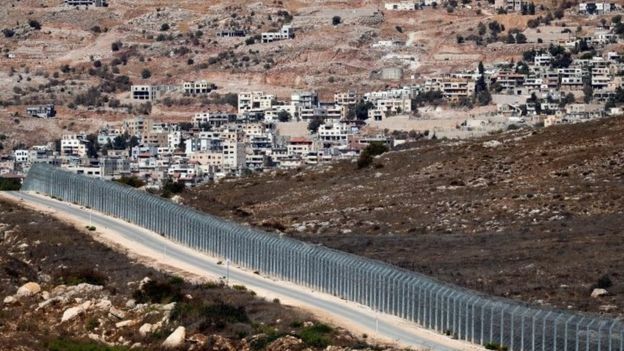 Syria has condemned as "irresponsible" US President Donald Trump's comments that it was time to recognise Israel's sovereignty over the occupied Golan Heights. A statement published by the Syrian state news agency said it showed the "blind bias" of the US towards Israel. It said Syria was determined to recover the area "through all available means". Israel captured the Golan Heights from Syria in 1967 and annexed it in 1981 in a move not recognised internationally. Israel wants to contain the military presence of its arch-enemy Iran in Syria, which has grown stronger throughout eight years of conflict. Mr Trump's remarks on Thursday overturned decades of US policy on the issue. In a tweet, he said the plateau was of "critical strategic and security importance to the State of Israel and regional stability!" Israeli Prime Minister Benjamin Netanyahu thanked the US president in a phone call, telling him "you've made history". The statement carried by the Sana news agency said Mr Trump's comments had shown "contempt" for international law and that they would not change "the reality that the Golan was and will remain Syrian, Arab". "The Syrian nation is more determined to liberate this precious piece of Syrian national land through all available means," the unnamed foreign ministry source added. Mr Trump's remarks come as Mr Netanyahu faces a closely fought general election on 9 April, as well as a series of possible corruption charges. The two leaders are due to meet in Washington DC next week, when Mr Netanyahu is due to address the pro-Israel lobbying Aipac group. In 2017, Mr Trump recognised Jerusalem as Israel's capital and ordered the relocation of the US embassy to the city from Tel Aviv. The decision was condemned by Palestinians, who want East Jerusalem to be the capital of a future Palestinian state, and the UN General Assembly demanded its cancellation. Mr Netanyahu tweeted his thanks to Mr Trump, saying: "At a time when Iran seeks to use Syria as a platform to destroy Israel, President Trump boldly recognises Israeli sovereignty over the Golan Heights". The US ambassador to Israel, David Friedman, praised Mr Trump's "moral, courageous and just decision". The EU says it does not recognise Israeli sovereignty over the Golan, and its position on the issue "has not changed". Iran, whose forces are also backing the Syrian president, called the US position "illegal and unacceptable"
Turkish President Recep Tayyip Erdogan, who has supported the Syrian opposition in the war, said the remarks had "brought the region to the brink of a new crisis"
Arab League Secretary-General Ahmed Aboul Gheit said the announcement was "completely beyond international law"
Richard Haass, a former senior US state department official who is now president of the Council on Foreign Relations think-tank, said he "strongly disagreed" with Mr Trump and that the decision would violate a UN Security Council resolution "which rules out acquiring territory by war". If the announcement came as a surprise, it was a good surprise for Mr Netanyahu. And the surprise would have been in the timing, not the substance, because the idea of the US recognising Israel's sovereignty over the Golan has been under active consideration for some time. Israel has gained traction in the White House and parts of Congress by arguing that Iran is using Syria as a base from which to target Israel, with the Golan Heights as the front line. But the formal US recognition doesn't change anything on the ground: Israel was already acting with full military authority. Critics have concluded this was a blatant attempt to give Mr Netanyahu a boost in a hotly-contested election. If so, it's one that violates important principles of international law, they say: Mr Trump has endorsed the seizure of territory, and will have no moral authority to criticise Russia for doing so in Ukraine's Crimea.